There is a light at the end of the tunnel for beauty enthusiasts searching for an easy, topical solution to acne and inflammation. 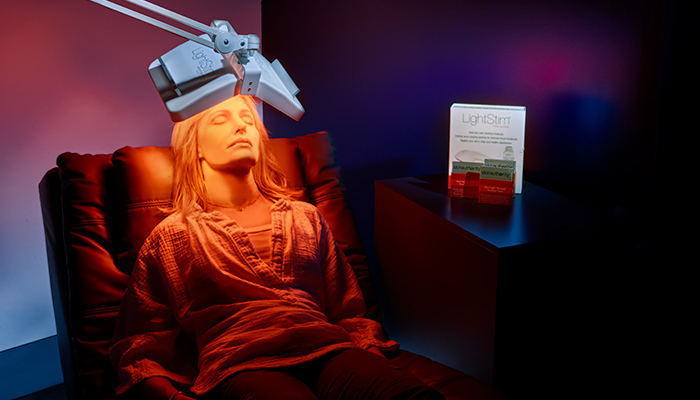 Seattle Sun Light Spa offers innovative photofacials, including a Blue Light Anti Acne Photofacial that focus a combination of FDA-approved blue, red and infrared light to destroy acne-causing bacteria and stimulate cells to increase collagen production; treatment is given in 25-minute sessions ($55), three to five times a week. “Blue light photofacials destroy acne-causing bacteria and reduce inflammation and redness, heal existing blemishes and minimize future breakouts,” says consulting internist Eli Kramer, M.D. The cryotherapy facial—dubbed “frotox” by some—gives the phrase “in cold blood” a whole new meaning. A form of wellness used by athletes and beauty enthusiasts alike to treat achy joints and inflammation, this new iteration of the subzero experience uses liquid nitrogen to blow freezing air (minus 260 degrees Fahrenheit) over the face for approximately eight minutes. Enthusiasts of the facial say the procedure exfoliates the outer layer of the skin, increases collagen production and makes the skin appear brighter ($25, first treatment; $45 per session). This treatment, helpful to those with more severe facial scarring or wrinkling, utilizes fine-tuned lasers that are split into hundreds of separate pixels to remove problem skin and boost collagen production ($1,600 for the face, excluding the eye area, $1,000 for the eye area only or $2,500 for both). While this technique does not require as much recovery time as some traditional ablative lasers, which completely remove the top layer of skin, you can expect a noticeable progression of swelling, crusting and redness for up to 28 days after your treatment. The results could be worth the wait. “This is my favorite laser, and I do a great deal of these treatments to reduce deep wrinkles, improve texture and blend scars,” says Heather D. Rogers, M.D., cofounder of Modern Dermatology. If you are considering this treatment, plan ahead. A consultation is required with Rogers, who also says that these treatments are not done in the summer, as a precaution against sun exposure. The likelihood of a fairy godmother waving a magic wand to solve our problems is next to nil, but the HydraFacial ($299) may be the next best thing. Ideal for all skin types, the treatment uses a patented machine, resembling a wand, to extract skin impurities while simultaneously infusing the skin with vitamin-packed serums. “The treatment is soothing, refreshing, nonirritating and immediately effective,” says Angela Rosen, owner of Penelope & The Beauty Bar. Clients can also opt to add four different “boost” treatments to address a variety of skin concerns, including dullness, aging and pigmentation. It’s a no-brainer that oxygen is an essential part of our existence, but Antonio Spa co-owner Masumi Hill is betting it will become a must for your beauty routine. The OxyGeneo Facial (from $180) uses a three-step patented process that exposes your skin to high amounts of carbon dioxide, which causes oxygen to rush to the skin. As a result, blood flow is maximized and a series of serums and minerals is more effectively absorbed into the skin. This, in turn, supports collagen repair, which leads to plump skin and reduced fine lines. Made popular by celebrities, the platelet-rich plasma (PRP) face-lift ($900) has become a sought-after treatment. Proponents say it’s effective and has a short recovery time. But if needles make you queasy, this might not be for you. A physician or nurse practitioner draws a patient’s blood, which is then spun in a centrifuge that separates the platelet-rich plasma. Part of that PRP is converted to platelet-rich fibrin and used for direct injections. The remainder of the PRP, which contains natural growth factors said to stimulate collagen production, is spread over skin that has recently been microneedled (a process that pricks the skin with small needles), which allows the substance to soak deeper into the skin. Bio-Therapeutic has been manufacturing products and equipment for spas around the world since the 1970s. You can experience the same treatments as the aestheticians who try out these products by visiting the company’s flagship spa, which specializes in tech-based skin care. The Layered Technology Facial ($100 for 60 minutes) uses high-tech gadgets such as a microsonic cleansing brush and a microcurrent device (designed and manufactured in Seattle), along with Bio-Therapeutic’s house-made Aquafuse product line, for smoother, hydrated skin. If you are hoping to get rid of that pesky double chin, SkinSpirit has a combination of specialized treatments designed to literally melt away your problems. First, CoolSculpting uses controlled cooling to kill fat cells (from $695); then, Kybella (an enzyme said to break down neck fat) is injected (from $700). While you might experience some localized tenderness and swelling from the latter, this treatment promises long-lasting results.